Captain's record stand with Rahul lifts host to 260 for 5, before spinners complete 88-run victory. Rohit Sharma scorched his way into the record books, equalling the record for the fastest century in Twenty20 Internationals, to help India beat Sri Lanka by 88 runs in the second T20I at Holkar stadium in Indore on Friday. In the process, India also took a winning 2-0 lead in the three-match series. The Indian skipper demolished the Sri Lankan attack, bringing up his century in just 35 deliveries, matching the record set by David Miller earlier this year against Bangladesh. The host finished on 260 for 5, its highest total in the shortest format of the game. A chase of that magnitude was always going to be tough. Sri Lanka put up a good fight, courtesy Kusal Perera and Upul Tharanga. Kuldeep Yadav and Yuzvendra Chahal, though, came back strongly, picking up seven wickets between them to reduce the visitor to 172 for 9 in 17.2 overs, with Angelo Mathews unable to bat due to injury. Sent in by Thisara Perera, Rohit and KL Rahul, the Indian openers, were circumspect at the start, with Sri Lanka bowling good areas. Rahul struggled with his timing and had a slice of luck off the second ball of the second over, when on 6, Sadeera Samarawickrama failed to hold on to a straightforward chance at backward point off Mathews. That was the opening Rahul needed, as in the next over he smashed Dushmantha Chameera, the medium pacer, for a humongous six over long off. 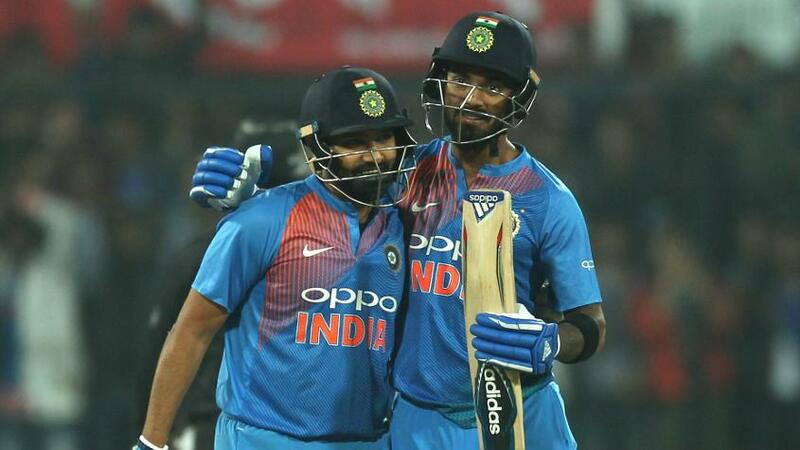 The opening partnership between KL Rahul and Rohit was worth 165 runs, a record for an Indian opening pair in T20Is. Rohit decided to join in on the fun and what followed was an onslaught of the highest quality. The next over by Nuwan Pradeep yielded 17 runs, followed by a 16-run over off Akila Dananjaya, as India raced to 59 for 0 at the end of the Power Play. Having matched Rahul shot for shot till that point, Rohit decided to take his game to another level. Asela Gunaratne was his first victim, as Rohit slammed the third ball of Gunaratne's first over, the ninth of the innings, for a six to get to get to his half-century in just 23 deliveries. He followed that up with another six as India reached the 100 mark in just 8.4 overs. Rohit reserved his best for his opposite number. Having gone for 12 in his first over, and just a single off the first two balls of his second, Perera would have been hoping to finish the over well. Rohit, however, carted the third ball — a back of the hand slower delivery — over deep midwicket for six, the fourth over long off, the fifth over the deep point fence, and the last over deep cover as he moved to 97 in just 34 balls. With just a hit away from the record, Rohit smoked the second ball of the 12th over through the covers to equal the fastest century in T20Is, also claiming the Indian record, beating Rahul's effort off 46 deliveries. To make matters worse, Mathews, Sri Lanka's most economical bowler till that point, hobbled off the field with a hamstring pull. Just when the Indian skipper looked set for more, he was undone by a slower bouncer by Chameera, tapping it to Dananjaya at short third man to fall for a breathtaking 43-ball 118, his innings studded with 12 fours and ten sixes. The partnership of 165 between the openers was India's highest in T20Is. Dhoni, promoted to No. 3, got into his stride quickly, thumping two boundaries on the trot off Dananjaya. Rahul, who, until then had taken a backseat, came into his own, reaching a half-century — his second in as many games — in 35 deliveries. 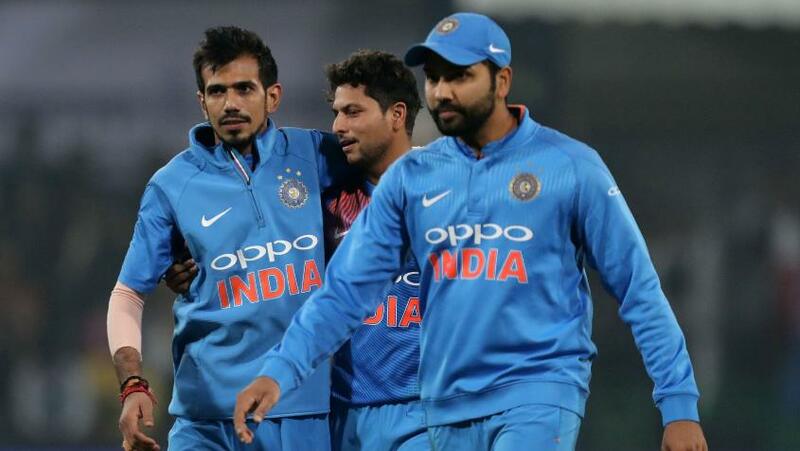 Kuldeep Yadav took all his three wickets in one over and derailed the chase while Yuzvendra Chahal finished with four scalps as the duo bowled out Sri Lanka for 172, sealing the series win by 88 runs. He whacked 38 in his next 14 deliveries, as India crossed the 200-mark in 16 overs. He was, however, dismissed 11 short of his second T20I ton, edging a length delivery off Pradeep behind with Dickwella flying to his right to complete a one-handed stunner. Rahul's 49-ball 89 was laced with five fours and eight sixes. The visitor denied India the record for highest T20I total, nipping out four late wickets as they finished just three short of that landmark. The Sri Lankan chase started frenetically, when Dickwella mistimed a scoop off the very first delivery, landing just out of reach of Kuldeep Yadav at short fine leg, and then was dropped by Rahul on 3 at square leg. He was unable to capitalise on those chances, and soon fell, failing to read a slower delivery from Jaydev Undakat, to be caught at deep square leg for a 19-ball 25. Kusal and Tharanga forged a 109-run partnership for the second wicket in just 53 deliveries, keeping Sri Lanka going at a healthy pace. Kusal, in particular, was severe on the Indian bowlers, pasting them to all corners of the park. Having had an uneventful return to international cricket in the previous game, he quickly got into his strides here, reaching his fourth half-century in just 26 deliveries. He took a particular liking to Kuldeep, smashing three fours and four sixes, but the left-arm wrist spinner had the last laugh, getting the batsman to mistime one to Hardik Pandya at long-off for an excellent 37-ball 77, which included four fours and seven sixes. It was a swift end once Kusal fell, as the visitor lost its last eight wickets for just 27 runs, with Chahal running through the Sri Lankan middle order to finish with figures of 4 for 52. Kuldeep was equally impressive, ending with 3 for 52.